Wedding details are a huge part of wedding photography. Bouquets can be part of the detail focus. 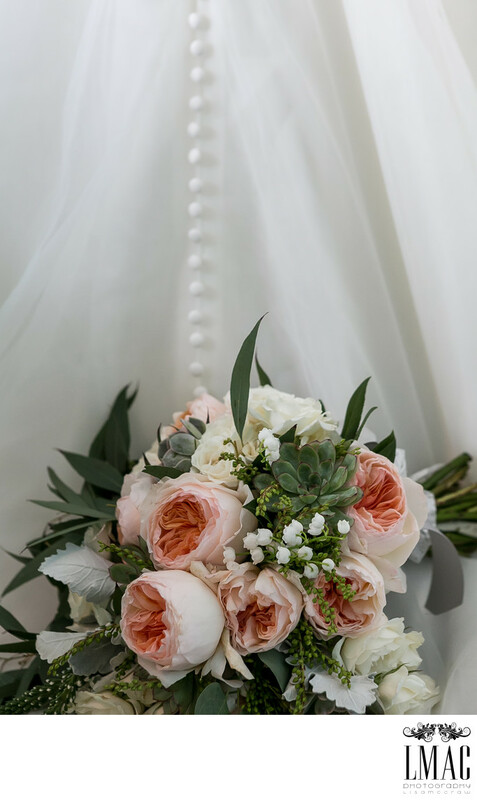 This bridal bouquet is absolutely stunning with big peonies. Also, the back of the wedding dress makes for a beautiful backdrop to feature the color and beauty of this bridal bouquet. There are also succulents and baby's breath surrounding the pink peonies. Part of what LMAC does is to create art photos for our bride and grooms that can be utilized later as some type of print form in their home. We also want to feature as many bridal details as possible since bride and grooms work so hard on these details. Photographs of the wedding details are the best avenue to preserve these memories. It's a large part of wedding photography.